ZOYA IS DOING BAR GLITTER. I personally LOVE bar glitter, but it's fairly rare and really not commonly seen. I know it isn't everyone's cup of tea, but I am actually quite excited about this. If you've already seen this, feel free to skip past it, but if not, then it's worth a look! Rina (ZP576): Full coverage, rich green metallic shimmer. Holly (ZP577): Gorgeous green glitzy, glitter glaze (with unique bar glitter). Kissy (ZP578): Full coverage, party pink metallic shimmer. Izzy (ZP579): Vivid pink glitzy, glitter glaze (with unique bar glitter). Twila (ZP580): Full coverage, icy blue metallic shimmer. 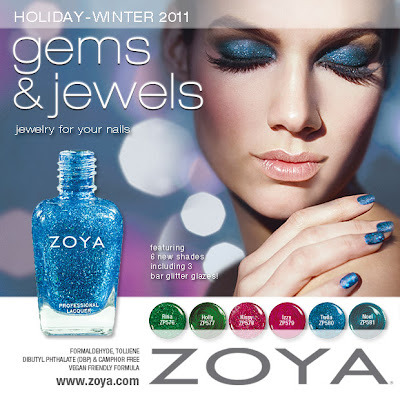 Noel (ZP581): Bold blue glitzy, glitter glaze! (with unique bar glitter). Release date is SEPTEMBER 15. OH MY GOD. I haven't seen this yet! How exciting! Although, based on the descriptions, it sounds like they might have mixed up Twila and Noel on the image or on the descriptions? OMG I can't wait! I just saw ALU's swatches and I can't wait for your swatches! I adore bar (tinsel) glitter too! It's going to take me some time to get the like names straight on this collection. I am all mixed up right now on what is what! I do like the concept for this holiday collection. That is amazing! I want them! Hi cutie, just thought I'd let you know that you have the wrong names with the descriptions. Your shimmers and glitters are backwards :P can't wait for your swatches too! Hazakaza, Krista: Haha, I didn't even notice! I just copied and pasted what they sent me. Thanks for letting me know! Cooooooooool! This is something different - I like it! Hehe, every time I come to your blog, you make me want to buy everything. :P You're the best enabler - my favourite beauty blogger for sure! I am not impressed with these colors. They are so generically Christmas-y looking,like all of the other brands do. I have liked all of the other Holiday collections they've come out with,but this one is just,bleh.